Pareidolia, a term that’s used to refer to the phenomenon which causes us to see or hear patterns when there really is none. It’s the Jesus on toast. It’s the Virgin Mary in your tree. It’s your demonic phrases in music that’s played in reverse. Does it really mean anything? Absolutely not. However, our brains are always trying to find something recognizable in random patterns. 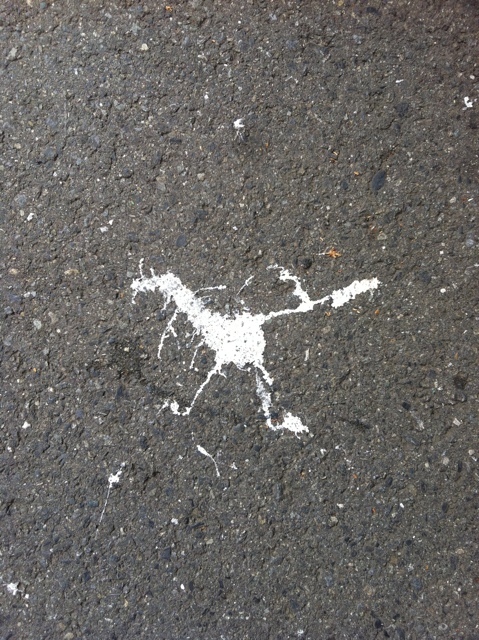 So, I bring to you the dinosaur that I discovered, Asphalt Paint Velociraptor! All hail Velociraptor! If you can’t see it, the head is on the left, the tail is on the right, and the legs are below. You can also see an arm on the left. 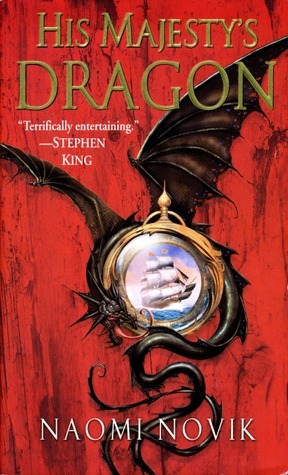 His Majesty’s Dragon by Naomi Novik is the first book in an eventual 9 volume series called Temeraire. This historical fantasy adds dragons to the Napoleonic Wars of the early 19th century. I long had an interest to read this series, and now I’ve finally begun it. So, what did I think? The story, which starts out with Captain Will Laurence on the HMS Reliant capturing a French ship and a dragon egg. From this moment on, we get to read how he and the dragon, Temeraire, become close and join the Aerial Corps. Britain is at war with the French, lead by Napoleon Bonaparte. Dragons are an interesting addition to the war. I imagined that I’d be reading a lot of battles, but that wasn’t the case. Much of the book was quite relaxed, involving Laurence’s developing relationship with Temeraire. In fact, it seems downright slow to begin with. But it improved a lot toward the end with actual battles and conflict. The first half was almost devoid of major conflict, just some minor disagreements. Excitement didn’t happen until the latter half of the book. I felt that the action was decent, and it was described sufficiently. But I felt like the plot wasn’t the focus of the book. The focus was the characters. Laurence is a very likeable character, as is Temeraire. However, Laurence seems to be a bit naive when he joins the Aerial Corps. His interactions with other characters seemed rather awkward. But he has a good heart. Lieutenant Granby was a good character that I liked quite a bit. He was developed pretty well. Emily Roland looks to be an important character in future books, though I have no idea what will happen. Although not developed as well as I’d like, Captain Catherine Harcourt on Lily is a character I want to find out more about. I hope to learn more in future books. Also, Maximus and Captain Matthew Berkley didn’t strike me as very strong characters. There are a lot more characters, but these are the main ones. This book’s strength is the characters. They are very well done, and I enjoyed them immensely. I want to see what happens to them in the future. Most of the story takes place in Scotland and England, with some time out at sea. It was described well, and I could imagine being there. I quite enjoyed the flight into the mountains of Madeira. I had a little trouble imagining the battle harnesses and how the people stayed on the dragons above and below. But my mind tried to make its own image. One thing that struck me about this book is how everyone speaks very cordially and formally. I’m not used to that kind of speech, so it seemed too polite at times. I don’t know if that’s how people spoke 200 years ago, but it’s possible. So, what did I think overall? I enjoyed this book. It was actually a quick book to read, and I had no difficulty finishing it in a short time. After reading a lot of heavy, violent, extremely serious novels, this was a nice break. I’m looking forward to the next book. I’d give this 3.5 stars out of 5. It’s very enjoyable, and dragon fans will be delighted. It’s a light read that gets better the more you read it. Definitely recommended. When I think Denny’s, I think 24 hour breakfast. That’s the way it is in Canada. But in Japan, it’s nothing like that. The food is made for Japanese tastes, and you can’t find one of Denny’s slams. Sure, it’s open 24 hours in Japan, but breakfast food is served only at breakfast. However, I went to Cafe Denny’s, which is a scaled down version of Denny’s with drinks and a handful of pasta and Japanese dishes. It was in Ito Yokado near Shonandai in Fujisawa. I was actually quite disappointed by the selection. But I did order something. Here’s what I ordered. My main dish, Ebi Macaroni Gratin. 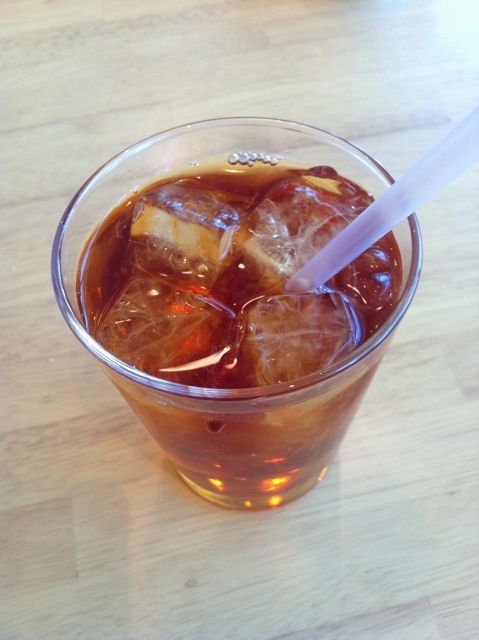 First of all, the iced tea is typical and nothing extraordinary. 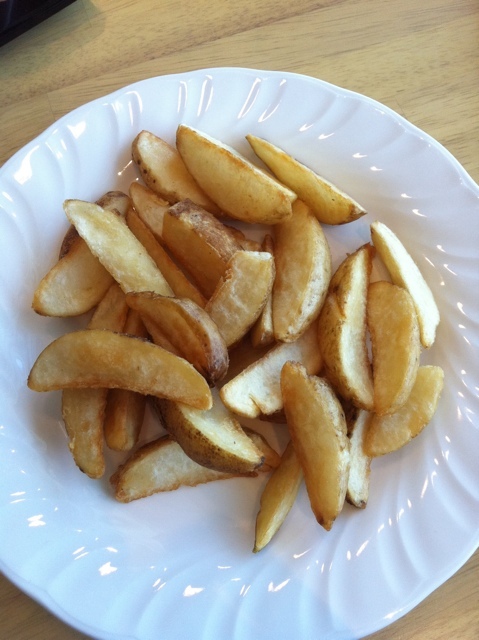 The fried potatoes aren’t seasoned, but they were fine. 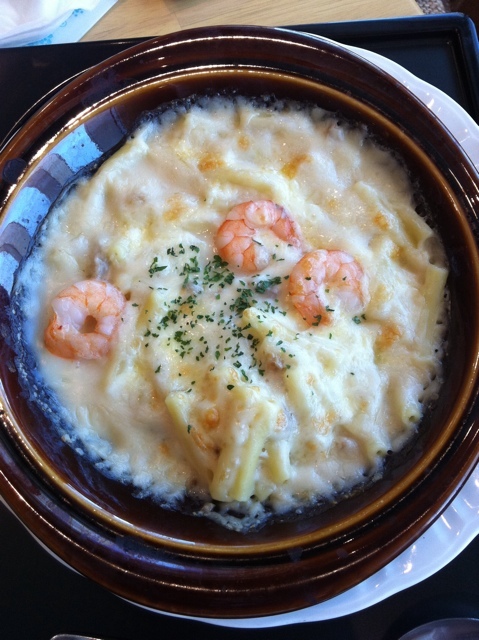 But the main dish, the Ebi (shrimp) Macaroni Gratin, was what I was looking forward to. It was okay, very mild flavour. I liked it. However, the portion size was unexpectedly small. I don’t think Cafe Denny’s is a place I’ll go again. It’s been a while since I’ve been to a restaurant. 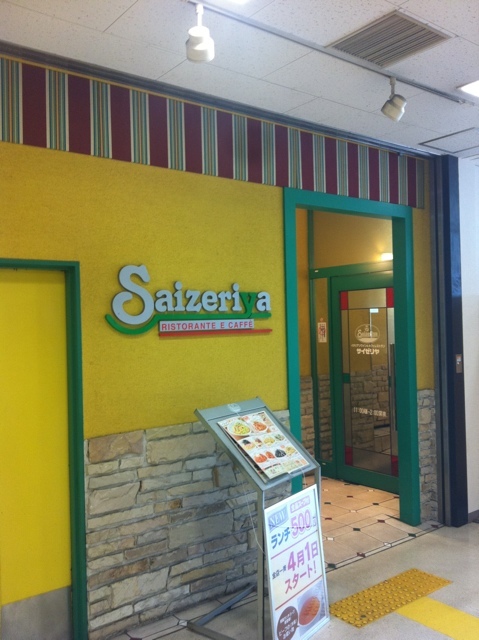 This time, we went to a very cheap Italian family restaurant called Saizeriya in Shonandai. The menu consists of mainly pasta, pizza, steak, hamburg steak, and plenty of appetizers. There’s a drink bar with unlimited drinks. I started my drinking off with Sukkiri Sparkling Orange Juice, which is a new drink. It’s not orange, it’s pink. It’s a sour-tasting orange juice, but quite good. 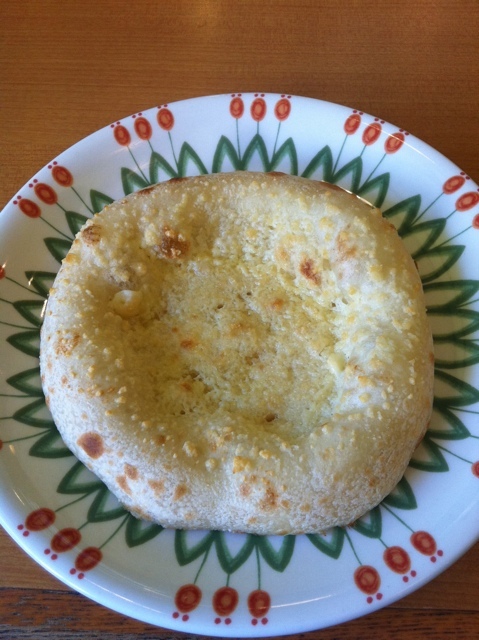 Then for an appetizer, I had the Cheese Foccacia. 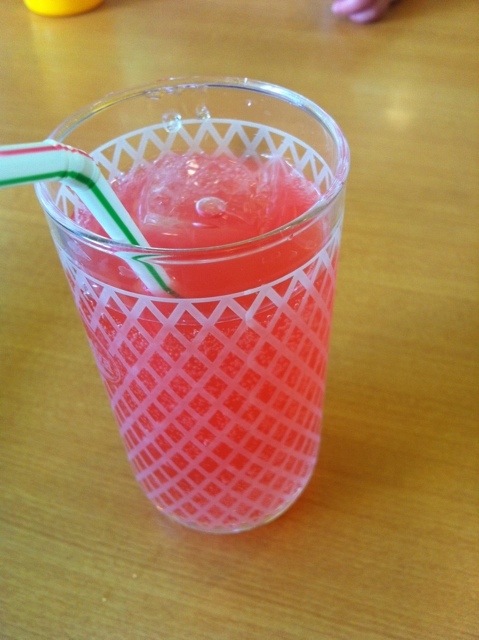 It’s only 159 yen, and it was very good. I liked it quite a bit. Very cheesy, though I did add some parmesan cheese. And then my main meal came. I ordered Spaghetti Pepperoncino with Bacon and Cabbage. It was only 399 yen! It’s pretty simple to describe. It’s a spicy chili pepper flavoured pasta with bacon and cabbage. It’s quite good for a cheap restaurant. Spaghetti Pepperoncino with Bacon and Cabbage. There’s a lot on the menu that I like, so it’s hard to choose. 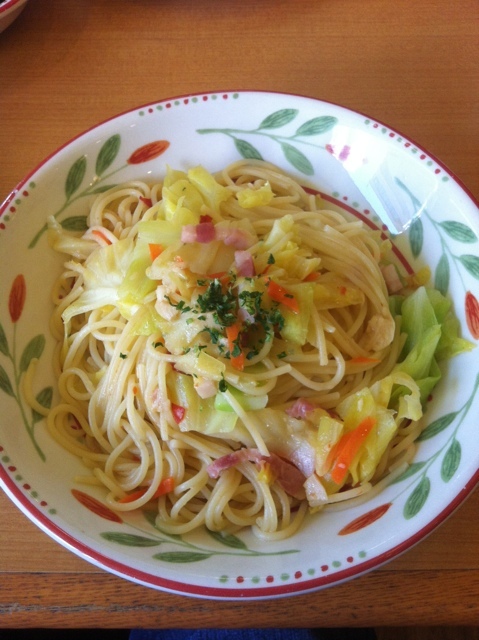 I also like the Spaghetti Carbonara, as well as some of the steak and hamburg steak dishes. This is a chain restaurant, so there are a lot of locations. 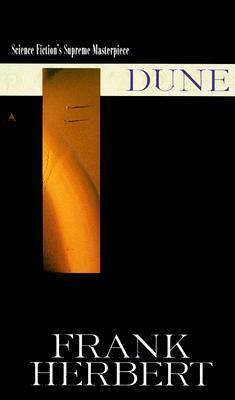 Dune, by Frank Herbert, is one of science fiction’s most famous novels. It’s the first book of the Dune Chronicles series of novels, and although published nearly 50 years ago, it still holds up very well. I don’t know why I always feel wary about reading older science fiction novels, but it may have to do with the fact that I am very scientifically literate, and older sci-fi tends to be incredibly corny and scientifically inaccurate. Well, I didn’t have to worry so much about Dune. It does wonderfully and exposed me to so many interesting ideas. Dune doesn’t rely on technology so much, although it is several thousand years in the future. In fact, computers are illegal in this universe. Selective breeding to create powerful minds is of the utmost importance. Technology takes a backseat to culture, and this is incredibly well-thought out. The cultures and religions are based on present ones, particularly Islam. I was very surprised. The book takes place mostly on a desert planet called Arrakis, and many terms from Islam are used, including Jihad, hajj, and Ramadan. However, as this takes place several thousand years in the future, the religions of the book are very different than their modern counterparts. As I said, the setting of Arrakis is very well done. There are two other planets that feature, Caladan and Giedi Prime. Caladan is a paradise, and is home of the House of Atreides, which gains the power of Arrakis. Giedi Prime is home to the House of Harkonnen, which was previously in charge of Arrakis. Arrakis itself has a native people, the Fremen, who feature very prominently in this book. Arrakis becomes a very real place, it’s so wonderfully described. The sandworms are incredible creatures that prove to be more important than I’d originally thought. The main character is Paul Atreides, the son of Duke Leto Atreides and his concubine and Bene Gesserit Jessica. The Bene Gesserit are women who are trained from a young age for powerful mental and physical skills. In the employ of the House of Atreides are Thufir Hawat, the Mentat (basically human computers), Duncan Idaho, Dr. Yueh, and Gurney Halleck. These characters all show incredible depth and development throughout the book. The main antagonists are Vladimir Harkonnen and his nephew Feyd-Rautha. They’re written in such a way that you can’t help but hate them. I felt no sympathy toward them. Also important are Stilgar, the leader of the Fremen and Chani, a Fremen girl who becomes more than a simple girl. The cast of characters is so great that I can’t list them all. I liked Halleck quite a bit, though. He was one of my favourites. The story follows Paul as he develops from one of the few males getting Bene Gesserit training to the man known as Muad’Dib, a prophesied leader of the Fremen. I’d actually seen the movie many years ago, but I barely remembered any of the plot, so it felt fresh to me. The complexity was quite high, and I was often having to guess what was going to happen. There were a lot of surprises. I can see why this is considered one of the greatest science fiction novels of all time. One thing that I consider to be a sign of a great book is its ability to draw me in emotionally. I felt many things, particularly in the more tense moments. During the final part of the book, I was so involved, I felt like I was there watching everything happen. It was that powerful. So, how would I rate it? I have to give it a full 5 out of 5 stars. It truly is an amazing story. Recommended to every science fiction fan, and even fantasy fans. It may have been sci-fi, but it had strong fantasy-like qualities. It has broad appeal.